We have given out a few forms for contact details and show concent. If you have recieved one of these then please can you complete and return it ASAP. Your child cannot perform in any of our shows without us having a copy of your concent. If your child has performed in previous shows then we will still have your forms so do not worry. Also if your mobile number has changed please remember to let us know your new one, we do need a emergancy contact number for every pupil. Welcome to the 'Island Dance Fusion' dance school website. Based on Hayling Island and dancing all over the world, the emphasis at Island Dance Fusion is on having fun. The school teaches mainly Freestyle and I.S.T.D Disco and Tap. But musical theatre and rock and roll and swing also get a look in! 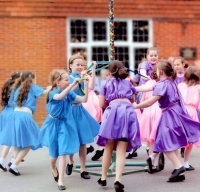 We have a wide range of dance classes so all ages and all abilities are catered for. We are always busy with shows or displays (both local and further a field) and so there is always something going on. Also if you need that personal tuition, then we can provide that too. Please take a look at this website and contact Wendy if you would like more information.